Description: Maria Romano is an old woman in a mental hospital being interviewed by a young PhD candidate. 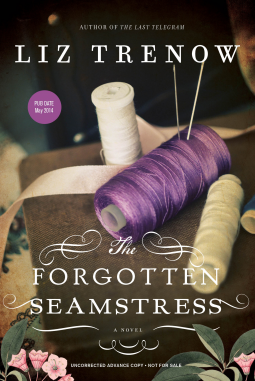 She spins her tale of being a young orphan with a skill for needlework who ended up working for the British Royal family. Caroline Meadows is a young woman without a job, without a boyfriend and with a mother whose memory is fading. When she comes across an old quilt that belonged to her grandmother it gives her something to latch onto and something to help her find her creativity so long buried. Pros: I love books that weave together past and present and I was so impressed with how that was accomplished in this book. Maria's story is true narrative form. We are reading her taped interview with the student. While this can often feel about as interesting as reading a legal deposition Maria's personality comes through in spades. I found myself genuinely caring about Maria and wondering what was going to happen to her and how all the little strings were going to come together. Caroline's story was told more in action. She's trying to find the quilter and trying to figure out what to do with her life. It was very easy to keep track of what was when and who was who. The talk of Maria's sewing was so interesting and I was fascinated by the information on the royal silks. I was also so intrigued by the quilt itself which is almost a character in the book. While many of the things that happen are very dark and horrible there is a certain wall kept between the reader and the events since most are occurring in the past. It makes for a slightly less gut wrenching read while not diminishing the connection to Maria, Nora and later Jean. Cons: Caroline took awhile to really like. She was nice and interesting and would be a great friend but her personality didn't seem nearly as powerful as some of the other characters. I did spend some time wanting to give her a hug though, for lots of the book she really needed one. Overall: This was one of the books I've been most anticipating reading this spring and I was in no way disappointed. I'm a complete non-sewer and still found the sewing talk interesting. I loved the characters, loved the plot and really enjoyed how everything worked out in the end. I like stories that weave together the past and present also, and this sounds like one I would really like. I really enjoyed this one. I liked the trick of doing the past in the style of someone telling a story and the present in 3rd person. It really worked. Hopefully you'll enjoy it too! I've had my eye on this one a bit, it sounds like a good read and I kind of like when a character isn't my cup of tea in the beginning. I like learning to like them. Great review. I really enjoyed this one. Totally agree on liking not starting off connecting with a character. I'm more impressed by the actual writing if they can make me like someone I didn't like or want to continue reading book about characters I don't like! Love when a book lives up to your expectations - especially when you've got high expectations! Yes! I've had so many lately that haven't I figured I deserved a good one!